The panel that House Democrats created to combat global warming is called the Select Committee on the Climate Crisis, but the fossil fuel connections of the members named yesterday suggest to some environmentalists a certain lack of urgency. Industry advocates, however, support the watered-down aims of the panel and defend the campaign and pocketbook ties its nine Democratic members have to fossil fuel companies (Greenwire, Feb. 7). During the 2018 election cycle, those lawmakers or their leadership political action committees (PACs) received nearly $238,000 from the oil and gas and electric utilities industries, according to contributions analyzed by the Center for Responsive Politics, a group that tracks money in politics. Of that total, about $190,000 came from electric utilities, not all of which primarily rely on planet-warming fossil fuels to produce power. Many of the committee members — including Chairwoman Kathy Castor (D-Fla.), Rep. Ben Ray Luján (D-N.M.) and Rep. Suzanne Bonamici (D-Ore.) — also have investments in fossil fuel assets, E&E News found during a review of their financial disclosures. "This points to the pervasive ways in which the fossil fuel industry is unfortunately present in far too much of our economies, both political and financial," said David Turnbull, a spokesman for Oil Change USA, one of the environmental groups pushing lawmakers to sign a pledge rejecting fossil fuel campaign contributions. "We need to divest from fossil fuels in all sectors of our society — they're bad investments, bad actors, and bad for our climate and communities," he said. So far, just 41 of the House's 435 members have pledged "to not take contributions from the oil, gas, and coal industry and instead prioritize the health of our families, climate, and democracy over fossil fuel industry profits." No Republicans have made that commitment (E&E Daily, Jan. 30). The only current pledge-taker on the climate crisis committee is Rep. Mike Levin, a freshman Democrat from California. Meanwhile, the Democratic committee member who raked in the most oil, gas and electric utility cash last election cycle was Luján, the former chairman of the New Mexico Public Regulation Commission. He and his PAC accepted some $113,000 from energy interests last campaign, almost $88,000 of which came from utilities. Luján's personal finances are similarly tied to the fossil fuel industry. In his handwritten House financial disclosure statement, Luján listed more than $50,000 in the New Mexico public employees pension plan. Six of that plan's top 10 stock holdings are in oil and gas pipeline companies, including Dakota Access pipeline builder Energy Transfer Partners LP and Enbridge Inc., which in 1991 was responsible for the largest inland oil spill in U.S. history. "My values and voting record are clear," said Luján, who during his congressional career has sided with the League of Conservation Voters 96 percent of the time. "I respect and recognize New Mexico's long history as an energy state, that is why, throughout my career, I have fought to ensure that New Mexico is a leader in our clean energy future." Republicans haven't yet named which of their lawmakers will join the panel. Soon after Democrats won the House, some upstart environmentalists and newly elected progressive lawmakers began pushing party leaders for a select committee tasked with crafting a sweeping climate policy by 2020, without any influence from fossil fuel companies (Greenwire, Nov. 30, 2018). Instead, they got the climate crisis committee, which lacks the power to write legislation or issue subpoenas. Castor, the seven-term lawmaker whom Speaker Nancy Pelosi (D-Calif.) chose to lead the panel, was quick to downplay progressives' expectations for it. Soon after being tapped last December, she argued that Democrats couldn't bar members from serving on the committee if they take money from the fossil fuel industry. "I don't think you can do that under the First Amendment, really," said Castor, whose campaign and PAC accepted a total of more than $7,000 from electric utility interests last election (Greenwire, Dec. 20, 2018). Then news broke later that month that Castor and her husband had an investment worth over $50,000 in a mutual fund comprising mostly holdings in utility companies. They "divested from the Franklin Utilities Fund to build confidence in her leadership of the Select Committee on the Climate Crisis," Caster spokesman Steven Angotti said in an email published by the investigative news site Sludge on Jan. 30. But the day before that story went up, Castor acknowledged in a House report that they'd purchased more than $15,000 of stock in Berkshire Hathaway Inc., which has rejected calls to drop its fossil assets, and invested at least $1,000 in common units of Blackstone Group LP, which also has oil and gas holdings. 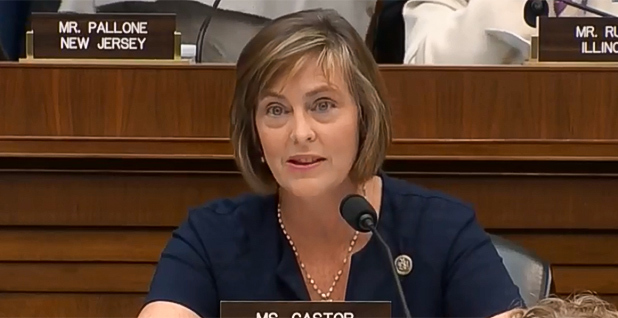 When asked about the chairwoman's mixed messages on fossil fuel investments, Castor's office responded only with her statement announcing the committee's Democratic roster. "The newly appointed Democratic members of the Select Committee on the Climate Crisis are ready to stand up to corporate polluters and special interests as we press for urgent action to dramatically reduce greenhouse gas emissions and move toward a clean energy economy with a qualified workforce and a just transition," Castor said. "Climate deniers, fossil fuel companies and other special interests have had an outsized influence in promoting outdated, dirty policies and we will stand up to these forces — we have no choice." Some environmentalists are calling on the chairwoman, whose net worth was estimated by Roll Call last Congress at around $3 million, to go further. "Representative Castor could send a strong signal to these banks and fund managers and set an example to other lawmakers by moving her assets out of any funds or stocks with fossil fuel assets unless and until they fully divest their businesses and investments from fossil fuel activities," Oil Change USA's Turnbull said. The investment portfolio of Bonamici — a committee member who's also worth about $3 million — contains mutual funds with significant fossil fuel assets, as well. Her most recent disclosures show she and her husband own over $50,000 worth of iShares MSCI EAFE Value ETF, 15 percent of which is composed of companies with significant coal, oil and gas reserves, according to As You Sow, a nonprofit shareholder advocacy group. And Bonamici's husband, U.S. District Judge Michael Howard Simon, owns more than $250,000 of shares in the Vanguard 500 Index Fund, 10 percent of which is invested in fossil fuel assets. "The Congresswoman has demonstrated unwavering commitment to fighting climate change throughout her career in Congress and in the state legislature," spokeswoman Natalie Crofts said in an email. "On the Select Committee she will continue her work to combat climate change and make bold investments in clean renewable energy to protect the health of communities across the country, our oceans, and our planet," Crofts added. "She has repeatedly fought back against the fossil fuel industry and will continue to do so." The electric utility industry gave Bonamici and her leadership PAC nearly $19,000 last election cycle, and oil and gas interests chipped in over $3,000. But industry advocates don't see anything wrong with taking campaign contributions from fossil fuel companies and consider the divestment push an extreme and unnecessary move. "I think the pledge is unreasonable because many of these members have a broader focus than just the progressive, aggressive climate issues," said Frank Maisano, a senior principal at the firm Bracewell LLP. Criticizing committee members because of their personal fossil fuel investments, he added, is "another red herring that activists groups who want to oppose reasonable members that are going to take a more reasonable approach might find to get them out of being a participant in this."